This shot of a female Black Tipped Archduke was shot in the shaded forested area in the nature reserves. 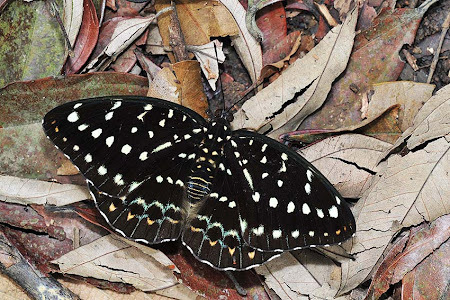 The genus Lexias is represented by three species in Singapore. The Black Tipped Archduke is so called, as its antennae tips are black compared to the Archduke (Lexias pardalis dirteana) which has prominently orange-tipped antennae. Males are dark velvety black with broad blue margins on both wings, whilst females are dark brown with yellow spots. All the species of this genus are forest-dependent species that rarely, if ever, leave the sanctuary of the forests. It is not observed in urban parks and gardens. Several individuals of all three species may be found feeding greedily on rotting fruits on the forest floor. The shot shown above depicts the typical feeding behaviour of the Archdukes foraging for decomposing fruits or organic matter amongst a bed of leaf litter. Under normal conditions, the Archdukes are skittish and fast-flying, usually gliding rapidly no more than a metre above the forest floor.